Woohoo, our first giveaway here! I’m excited. I love giving stuff away. I’m hoping this will be a monthly thing we do here. 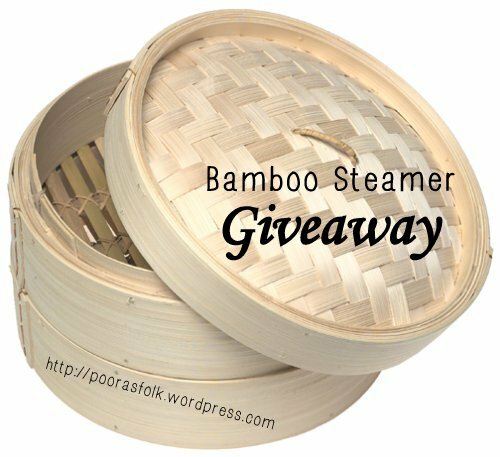 This first giveaway is for a bamboo steam set. Bamboo steamer baskets are made of interlocking trays with perforated bottoms that stack one on top of the other. The whole basket is placed over a pot of simmering water so the steam rises through the layers and cooks the food. You can cook almost anything in a steamer basket, from whole or sliced vegetables to foods like dumplings and fish fillets. Anything that benefits from gentle steam cooking works well in a steamer basket. 1. Fill the Steamer Baskets – First, line the bottom of each tray with lettuce or cabbage leaves to prevent the food from sticking to the basket. Then add the food you want to cook in a single layer. Make sure the top layer is covered with a lid. 2. Fill a Pot with Two Inches of Water – Make sure your steamer basket fits snugly in (or over) the pot and isn’t in danger of tipping over. Also make sure the bottom layer of food will sit above the water line and doesn’t get submerged. A wok is traditionally used, but we find a shallow skillet works just as well. Add about two inches of water to the pan and bring it to a simmer. 3. Place the Steamer Basket Over the Pot – Once the water is simmering, settle the steamer basket over the pot. Keep an eye on the water level and add more if the pot starts to go dry. Check your food periodically until it is done to your liking. You can infuse more flavor into your steamed foods by using broth or another liquid instead of water. Lining the trays with things like banana leaves, pandan leaves,shiso leaves, corn husks, or even grape leaves can also add subtle flavors. If you need visual, there are a lot of videos on youtube that demonstrate how to use a bamboo steamer. I’m also throwing in a few pieces of reusable muslin cloth, which you’ll need for steaming rice. To enter , just fill out the form below and leave a comment here on the blog telling me what your favorite veggie is. It’s that easy. Giveaway beginning 9/11/2013 and ends 9/20/2013. Open to U.S. residents only this time. Favorite vegetable is lemon cucumber although, in truth, it’s a fruit. Also like kale and golden beets. I’m on a cauliflower kick lately. my favorite veggie is kale-all kinds of kale.